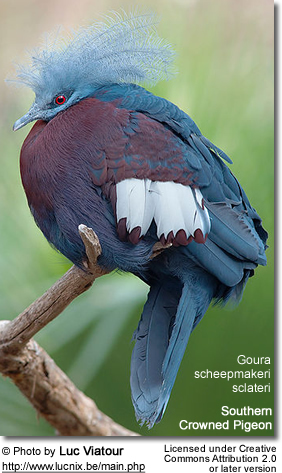 Pigeons and doves comprises some 300 species of birds in the order Columbiformes - all of which are related to the extinct dodo. 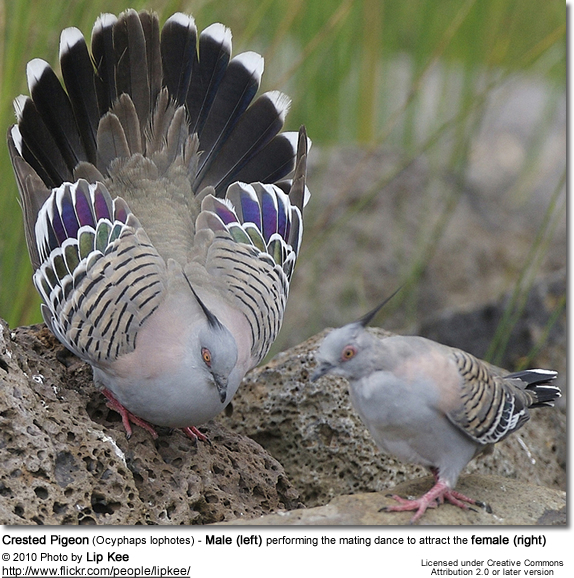 The terms "dove" and "pigeon" are used interchangeably, although smaller species are more likely to be called doves. 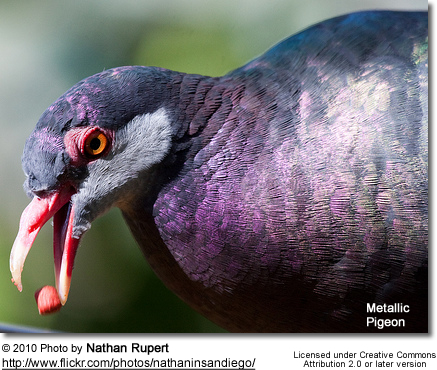 The species commonly referred to just as the "pigeon" is the feral Rock Pigeon. People who keep pigeons are commonly referred to as "pigeon fanciers". The average lifespan is 10 to 15 years. 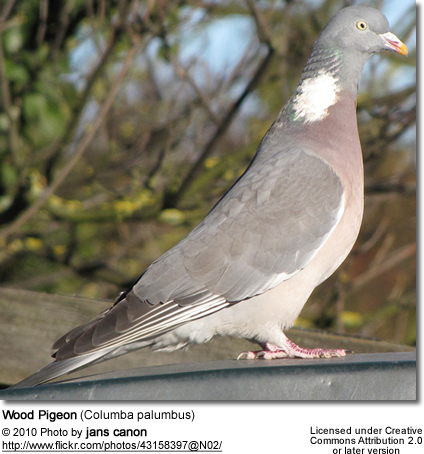 The oldest recorded pigeon was around 33 years. They reach reproductive maturity when they are about 6 to 10 months old. These stout-bodied birds have hort necks and short slender bills with a fleshy cere. 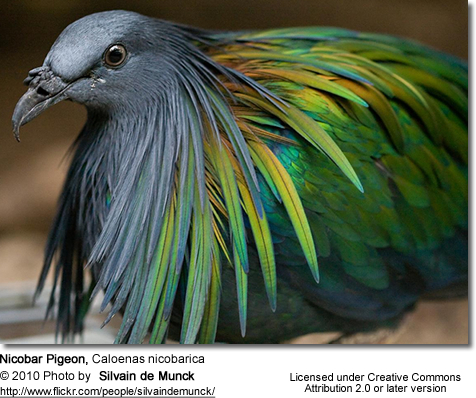 They come in a variety of plumage colorations - especially in captivity, where numerous mutations have occurred. Their calls area very pleasant cooing (coo-coo-coo-cu-cu). Flocks take off with a loud clattering. When breeding, they emit husky 'hooh-hrooo' calls. Feral pigeons mate for life. They usually build flimsy nests using sticks and twigs they collect from their environment. The average clutch consists of two white eggs, which are incubated for about 18 to 19 days by both parents. They are excellent breeders and may produce up to 8 clutches each year under optimal conditions. The frequency of breeding is dictated by the abundance of food. They produce "crop milk", which is secreted by a sloughing of fluid-filled cells from the lining of the crop. Both parents produce this nutritious ‘pigeon milk’ which is regurgitated and fed to the young. A chick can double its birth weight in one day. The eyes open when the chicks are about four days old. At approximately 2 months of age the young are ready to leave the nest. They feed on seeds, fruits (including berries), green leaves, shoots, and other soft plant material. They also eat insects, including spiders.